This book celebrates more than 500 years of the dazzling visual culture of the world’s greatest magicians. 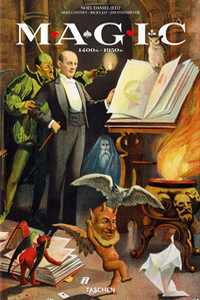 Featuring more than 1,000 rarely seen vintage posters, photographs, handbills, engravings and paintings, this 650-page volume traces the history of magic as a performing art from the 1400s to the 1950s. Combining sensational images with lucid and incisive text, Magic explores the evolution of the magician’s craft, from medieval street performers to the brilliant stage magicians who gave rise to cinematic special effects.